Pioneers in the industry, we offer absolute pressure gauge, differential pressure gauge for gaseous and liquid media, fischer differential pressure gauge gmbh, digital differential pressure gauge, differential pressure gauges and fischer da03 differential pressure gauge from India. ALVI – India in association with AVI – Australia takes pride to offer Absolute manometer for aggressive and non aggressive gaseous and liquid media – with Nuclear Safety and standard commissions KTA Approved. ALVI - India offer Fischer Germany Differential pressure gauge DA30. 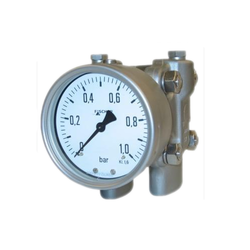 DA30 measures and indicates pressure and differential pressure. It is suitable to work with gaseous and liquid media not affecting the materials used. Electrical and electronic accessory components (KE) enable limiting of signal and transmitting of measurement. The DA30 is based on a rugged and uncomplicated diaphragm movement, suitable for pressure and differential pressure measurements. Zero adjustment: Screw through hole on top of dial housing. ± 25% FS. Electrical accessories: Limit signalling contacts: slow-action / magnetic snap-action / non-contact proximity type limit detector. Pointer rotation transducer: capacitance type, with output signal proportional to the pointer position. Liquid filling: For operating conditions involving vibration, pressure fluctuations, and/or moisture condensation inside, the gauge can be supplied with glycerine or silicone oil filling. Reference pointer: Adjustable pointer for visual marking of limit / reference value. Pressure connections: Process pipe connection to be erected by using bite type ferrule connectors or direct fitting of pipe into G½ F thread. Make sure that the connection is firmly sealed. ALVI Automation (Gas Alarm Systems ) offer Fischer Germany pressure GaugeMA13 for SF6, sulphur hexa fluoride. SF6 , Sulphur Hexa Fluoride is widely used in high power switch gear , electrical substation, electrical switch gear rooms to quench, suppress electrical discharge or electrical spark. 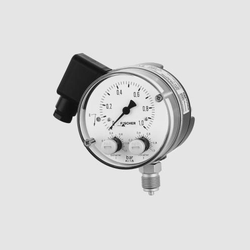 The pressure gauge MA13 for over-pressure and vacuum meets the high technical requirements of corrosion-resistance and interference immunity. It is used for liquid and gaseous media, except those having a high viscosity or are liable to crystallize. The measure pressure is transferred into the measuring element via the connection thread. By means of the pressure admission an elastic deformation occurs, leading to a movement of the measuring element. This movement is converted into a pressure- proportional pointer deflection via the motion work. The measuring element and the connection thread is one construction, together with the motion work and the scale. Therefore the measuring system is autonomical against forces acting on the case. Internal spring stops limit the pointer deflection up to 270 angular degrees. Regulations for prevention of accidents and div. laws require measuring instruments for special processes acc. to manifold safeguards. The type ’’bayonetcase acc. to DIN 16006“ meets these requirements disposing of following features: Blow-out of case back wall, frontwindow of security laminated glass, security against fracture via separating wall between measuring element and dial. The differential pressure gauges display P2 for panel mounting are used for the measurement of differential, positive and vacuum pressures. They offer an adjustable measurement range and two output signals, which can be selected in the menu. Type 990M with manual zeroing Type 990A with automatic zeroing. For optimal matching to the technical application, the pressure range can be continously set in the pressure range from 20% to 100% of the final value. In addition, the instrument offers three different units of pressure, which can likewise be selected in the menu. Differential Pressure Gauge / Differential Pressure Gauge and Switch. 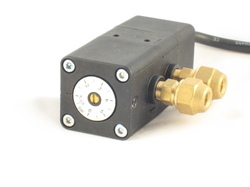 The DA03 serves as indicator of differential pressure. Follow mounting instructions in accordance to application. DA030A Explosion-hazardous areas zone 1 and 2, as well as 21 and 22, endangerment by gases and dry dusts. EN50020 para. 5.4 for usage in explosion- hazardous areas zone 1 and 2. DA031C Explosion-hazardous areas zone 1 and 2, as well as 21 and 22, endangerment by gases and dry dusts. Absolute pressure guage is used for monitoring gaseous and liquid media. The unit is in particular characterized by the fact that it is available in optionally stainless steel or HASTELLOY and therefore qualifies for diverse and aggressive media. As an option, the pressure gauge can also be equipped with limit signal switches as auxiliary electric components. Measuring ranges from 0..25 mbar abs to 0..6 bar abs serve to cover a wide measuring range.